Shelties (Shetland Sheep Dogs) are a smart and wonderfully fluffy breed. They were used to herd sheep and sometimes ponies, in the Shetland Isles, north of Scotland. If you have a Sheltie as a pet, you are sure to see his talents demonstrated from time to time. As a Sheltie owner, you are sure to want to hang a personalized Sheltie Christmas ornament on your Christmas tree this year. 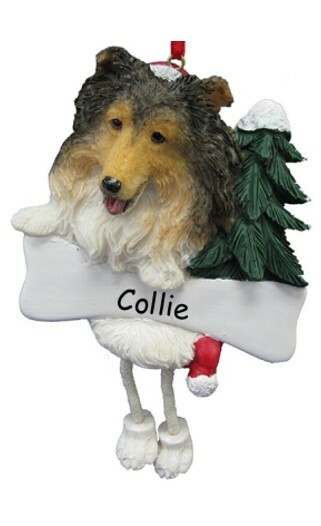 You will enjoy the ornament, personalized with your pet's name and the year if you like. This ornament is personalized on the banner, and is personalized by hand. Gift boxed.